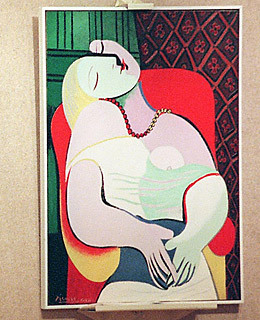 In 2006, casino mogul Steve Wynn agreed to sell this 1932 Picasso to fellow art enthusiast millionaire Steve Cohen. The selling price was $139 million — then the highest in history for a piece of art. Two days after the agreement was reached, however, Wynn (who suffers from an eye disorder that affects his peripheral vision) was entertaining friends at his Las Vegas casino when he accidentally thrust his right elbow through the canvas, leaving a silver-dollar-size hole. As a result, Wynn and Cohen agreed to invalidate the sale. The work was able to be restored, but its appraised value fell to around $80 million.